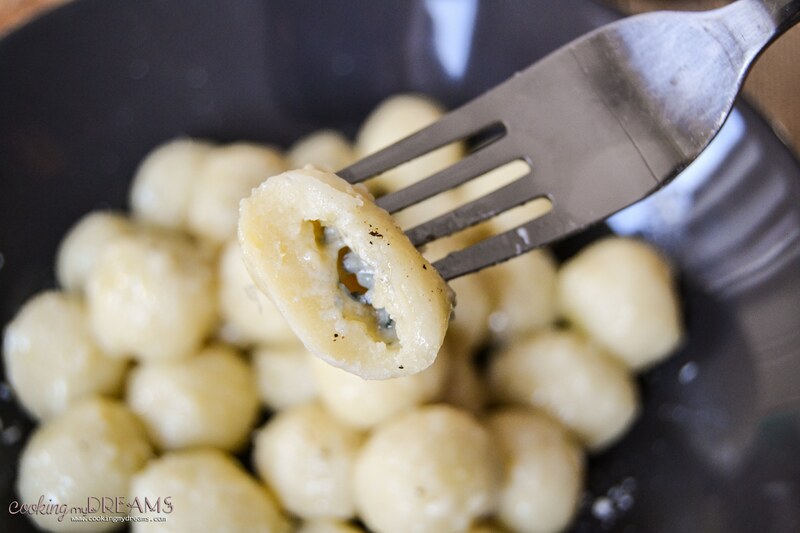 As a kid I never really liked gnocchi as I always ate the refrigerated kind bought at the supermarket and they are tasteless and hard to chew. 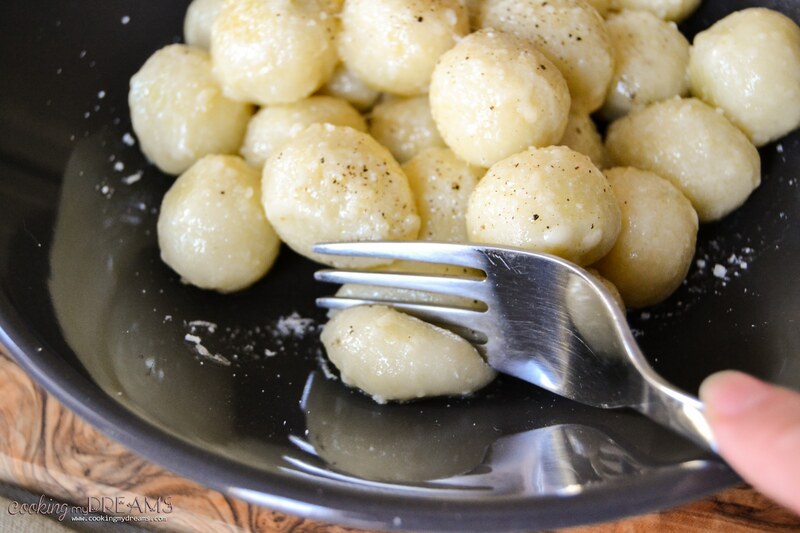 I never tried homemade gnocchi until a few years ago when my grandmother taught me a typical recipe from her region, Piemonte: Potato gnocchi with cheese fondue.. It was heaven at the first bite. Soft, pillows of potatoes that melted in my mouth, covered in a blanket of melted cheese. Just heaven. I always knew that homemade food was better than store-bought but I never thought there could have been so much difference in matter of taste and consistence! So I started making gnocchi at home, as it turned out to be quite easy and I never bought gnocchi at the supermarket ever since. 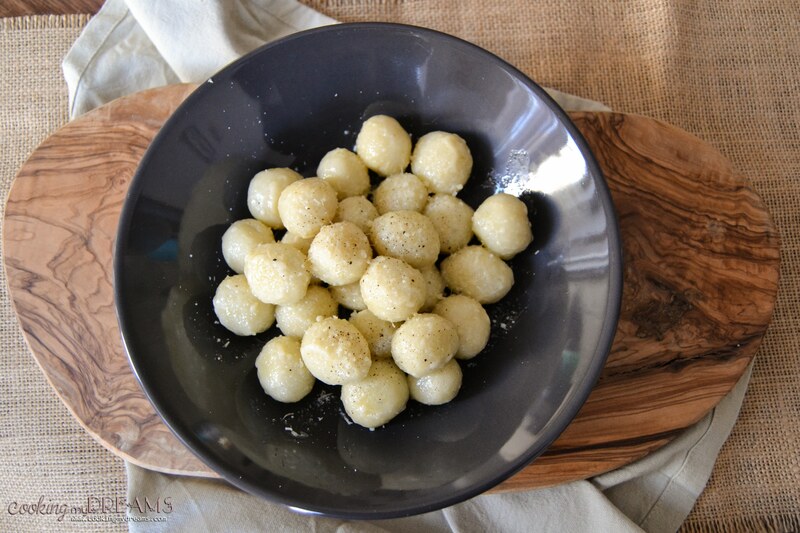 I tried so many flavors and experimented a lot of different kind of gnocchi and this recipe is one of them. 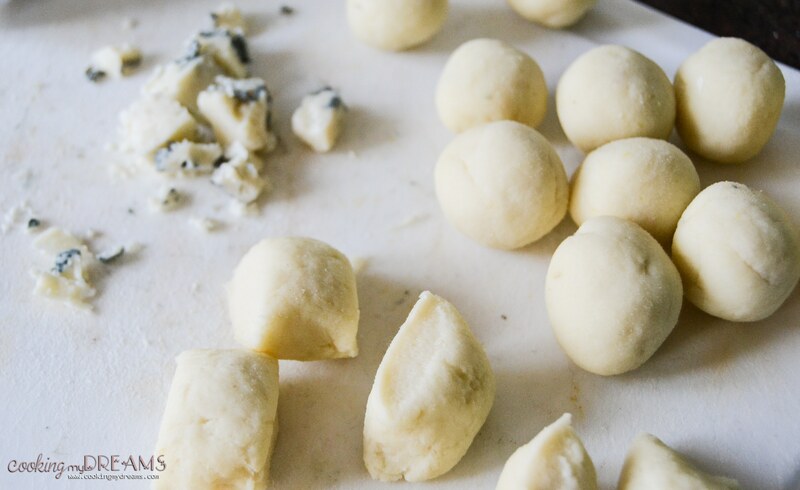 NOTE: This recipe is only for true Gorgonzola lovers as the taste is pretty bold. If you wish a milder taste, I suggest you to use a milder soft cheese instead, such as Brie or Camembert. Also, there is a big difference in flavour between Gorgonzola Piccante and Dolce; literally they mean Spicy and Sweet but the flavour is not spicy nor sweet, simply one has a stronger flavour and the other one is mild. Boil the full potatoes with the skin until you can easily pierce them all the way through (about 20-25 minutes, depending on the dimension of the potatoes), then wash them with cold water and remove the skin when they are still warm. Mash the potatoes when they are still warm and make sure there are no chunks; add a pinch of salt and 3/4 of the flour. Mix well with your hands until you get a nice soft dough (but not sticky); if necessary add some more flour. When the dough is ready, wrap it in plastic wrap and let it rest and cool down for about 10-15 minutes. Cut the dough in 3 or 4 parts, take 1 part and cover the rest with plastic wrap so it doesn't dry. Dust the cutting board with flour and roll the dough with your palm to make a long thick cord about 2 cm of diameter, then cut chunks 2 cm long. Roll each cube between your palms to make balls then press them on your palm to make a disc. 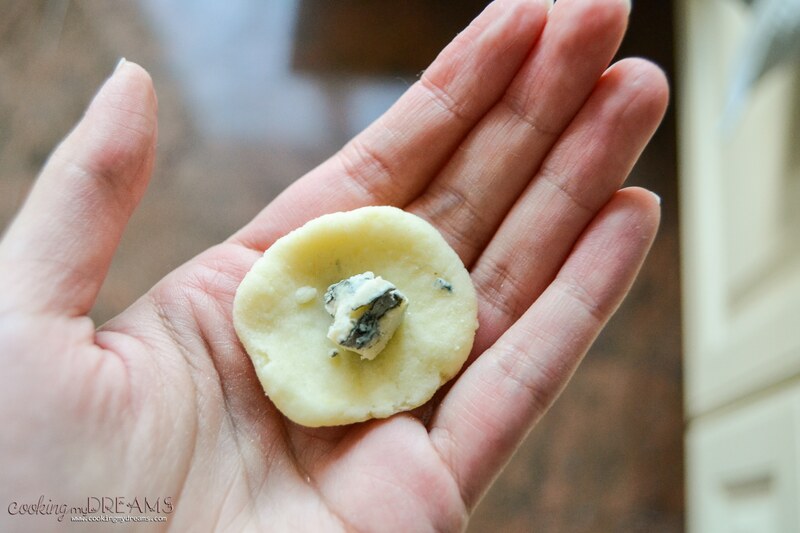 With a teaspoon, place a little amount of Gorgonzola in the center of the disc and close it on itself (make sure to cover the cheese well and close all the holes), roll it again between your palm to make the ball smooth and set it aside on a clean cloth. 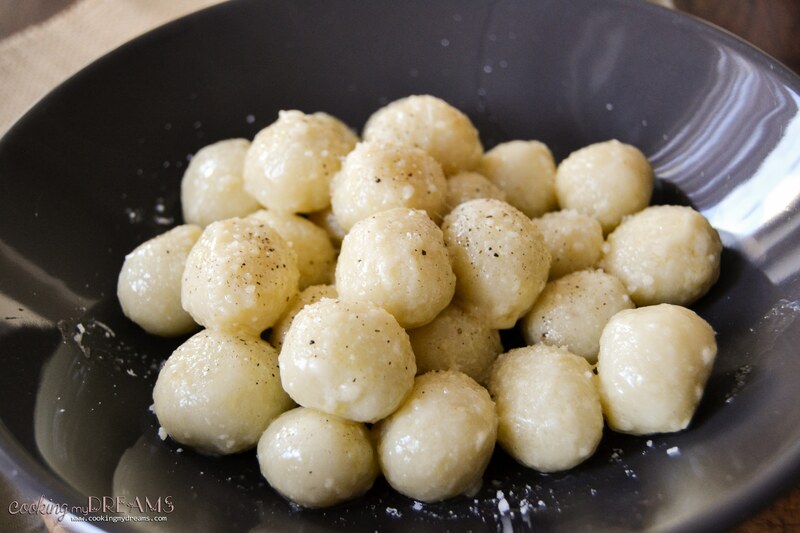 Bring to boil a large pot of salted water the slowly drop the gnocchi in and cook until they float on the surface. In a pan melt the butter and carefully add the drained gnocchi to sautée a little bit. Serve with freshly grated Parmesan and black pepper on top. Can I freeze these before boiling? Yes, sure! When you want to cook them, toss directly in boiling water without thawing.